We’re a big fan of data, but more than that, business intelligence that can be extracted from data. Eric Porres, Rocket Fuel CMO, addressed the challenges advertisers face in a world drowning in digital data. Really Big Data, though, poses its own challenges. 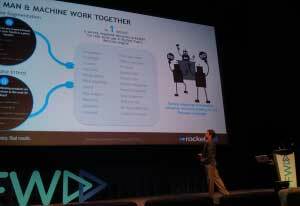 Rocket Fuel takes global-scale enterprise data and mines the information for meaningful patterns. Artificial Intelligence has a hand in taking millions to billions of data points, and connecting those dots. Some of the insights extracted for large brands seem to break ground – but even the process demands quite the commitment. Narrowing down the particular demographic that is most likely to purchase a Lexus after visiting the website requires tying together different networks and platforms into a mesh of data. Big Data holds the promise of extracting the promise of attribution – that one action leads to another, and then another. That final, desirable action can be tied back to initial, smaller actions. Technology is evolving to help advertisers dramatically improve and automate their campaigns across the web, social, video and mobile. Our clients expect measurability – and these advancements bring opportunities to keep apace with best practices for even the largest enterprises to close the loop – so that marketing dollars are attributed and accounted against real-world results.